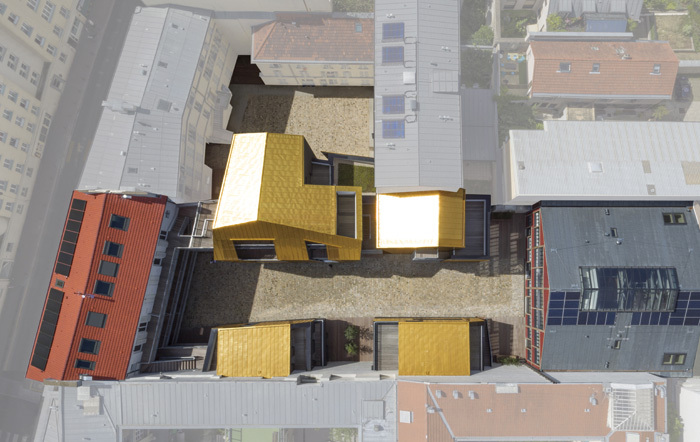 Off an unremarkable residential street in Paris’ peripheral La Villette neighbourhood, through a non-descript door, behind the facades of typical Parisian townhouses, you emerge into two linked courtyards dominated by what feels like a golden ark. 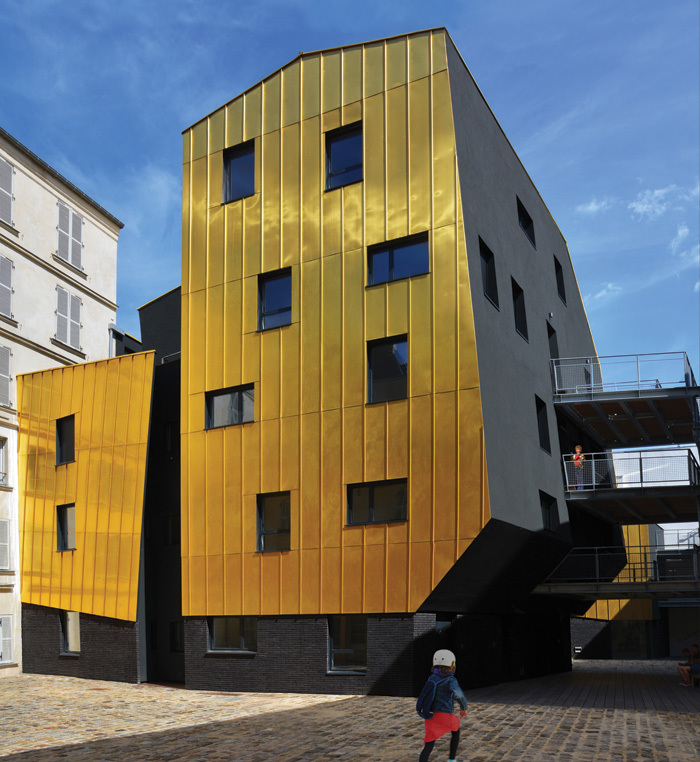 Designed by Metek Architecture for the City of Paris’ social housing landlord Élogie-Siemp, the 168 rue de Crimée project comprises 31 units of social housing spread across three new buildings — all boasting a striking gold and black aesthetic — and two renovated existing buildings: a restored printshop and a reconfigured traditional ‘faubourien’ townhouse. These 31 homes — all designed with dark-grey PVC flooring and bright white painted walls — range from studios to four beds; seven of them, located within the printshop, are affordable live-work studios for artists registered with the Maison des Artistes association. In total the project comprises 1,060 sq m of renovated space and 1,100 sq m of new build. 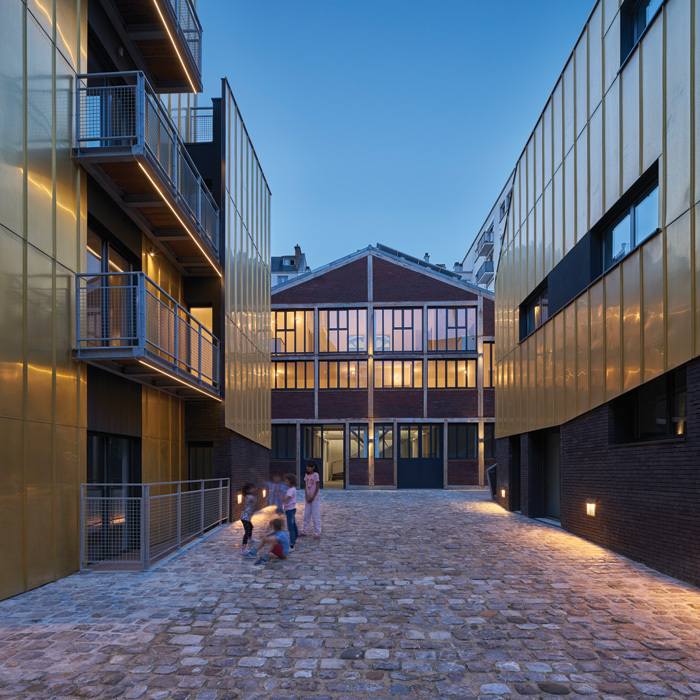 The development, which had a €5.2m budget and was officially launched in December, joins two formerly separate residential plots, creating a community space of two interconnected courtyards. The primary courtyard is envisioned as a ‘pedestrian street’ that serves all the surrounding homes and forms a gathering space for the residents, complete with young trees, benches and sleek exterior lighting from iGuzzini. It is the largest of the three new buildings — the ark-like ‘Pivot Building’ straddling the two courtyards — that arrests you as you enter the development; in any city, such a bold, modern, gilded structure would pack a punch, but in the context of a highly controlled and largely aesthetically homogenous place like Paris, the effect is even more impressive. The golden, ribbed cladding — used on all three new buildings — is, in fact, a combination of copper and aluminium, set over plywood, that gently reflects the sun and creates a warm, constantly shifting play of light. The client tried to push for a cheaper material, but Metek insisted on the alloy. What’s more, the aluminium largely prevents the oxidisation of the copper, ensuring relative material longevity (‘It'll be OK for about 30 years,’ reflects Bitter). The cladding forms an outer shell — cut back in parts, overlapping terraces in others — over sleek black brick and plaster below. The angular and asymmetrical envelopes of the three new buildings form striking irregular shapes in the setting. The resulting sloping walls and ceilings of some rooms make for exciting, if at times dizzying and disorientating, spaces. Outside, these unusual building shapes create a visual dynamism and shifting spatial experience as you move around the development. ‘We wanted to play with the existing Parisian roofscape,’ says Bitter of the surprising play of line. Bitter speaks more generally of wanting ‘to create a dialogue between the old and new’ across the site. Far from seeking to simply upstage their neighbours, the new buildings pay careful attention to this relationship to heritage and existing use — as does the renovation work in the townhouse and printshop. This relationship is present in elements both subtle and overt. The paving stones of the original courtyard have been reused, set alongside sections of new wooden decking. A sensitive new oak and brick facade — reconstructed according to historical documents — has breathed life into the printshop. The ‘faubourien’ townhouse was retained to keep the street facade consistent, but dramatically reconfigured inside to adapt the rooms and staircases to current regulations. The structural wooden beams of the printshop and townhouse have been retained, exposed and freshly painted in pale grey. A series of exterior passageways, staircases and landings connects the existing townhouse to the new buildings. These, like all the development’s stairways, balconies and terraces, have an industrial — if somewhat raw and unforgiving — design of galvanised steel with grated railings, softened by Ipe wooden decking. Nevertheless, they become a unifying aesthetic tool across the development, bridging the divide between old and new — quite literally, at points. The exterior passageways and staircases are also intended as a tool to enhance interaction and sociability among residents. Bitter explains that the project is envisaged as a ‘small village’. In the new Pivot building, the apartments are accessed off two exterior staircases, with a maximum of two entrances per landing, thus avoiding any long antisocial corridors. 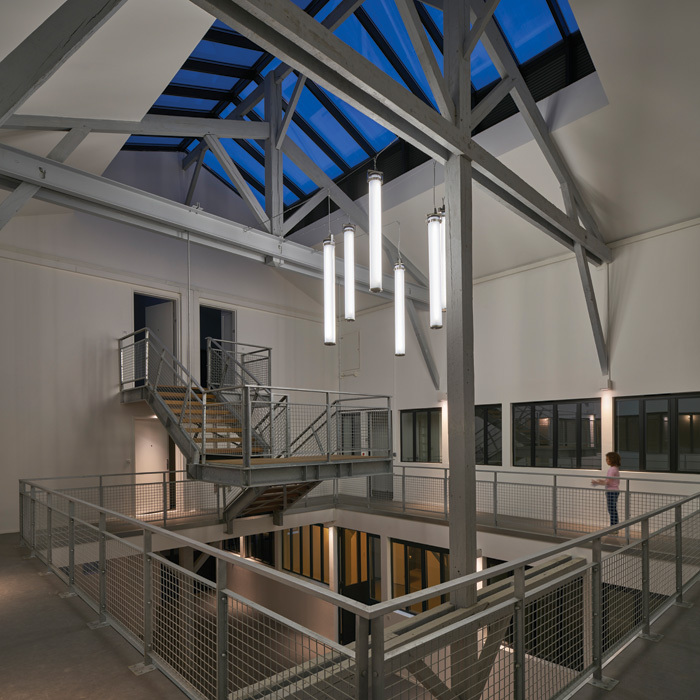 This focus on social space is present in the renovated printshop too, which arranges seven live-work artist studios (of various sizes) around a full-height atrium space, topped by a large skylight built into the roof. This atrium is intended as an ‘extension of the street’ and a place for communal events. The only shortcoming of the printshop, as a result of the original structure not being intended for residential use, is the limitation on natural daylight: some residential units only have windows out into the atrium, and rely on second-hand light from this skylight-lit interior space. But the residential units within the three new buildings certainly get better daylight, added to the fact that each has an exterior terrace or balcony and most are double or triple aspect. There are two duplexes on the upper two floors of the Pivot building: a four-bedroom 99 sq m apartment and a two-bedroom unit at 71 sq m. In the larger of these, the living spaces are bright and spacious, with high ceilings and views over the local Parisian roofs. Shafts of winter sunlight pierce the space. Several of the slim terraces across the Pivot building, overlooking the main courtyard, have sections overlapped by the golden exterior, subtly perforated to let light through. While this renders an interesting boundary between inside and out, light and dark, it also creates nooks for pigeons to nest in — and, consequently, make mess in. What’s more, where the perforated detailing of the overlapping cladding stops, the plywood backing begins, which — while invisible from the exterior — when viewed from within an apartment, looks like quite a startling design error. Not only does the raw plywood have the aesthetic of something both unfinished and low quality, but already, mere months after being installed, one could see significant weathering of the raw wood, with damp patches. It’s not the only instance of premature material weathering: the underside of the wood used for the exterior staircases and passageways is already visibly suffering. Along with perhaps the simple plastic flooring, these are the only noticeable instances where the restricted budget of the project becomes visible, in a development which otherwise bucks the expectations we might saddle upon social housing. There is otherwise great attention paid to sustainability in the project. It is a low-energy development — photovoltaic panels and solar panels are installed on the roofs of the rehabilitated buildings for domestic hot water and power generation, and a power-pipe system generates energy from used water. 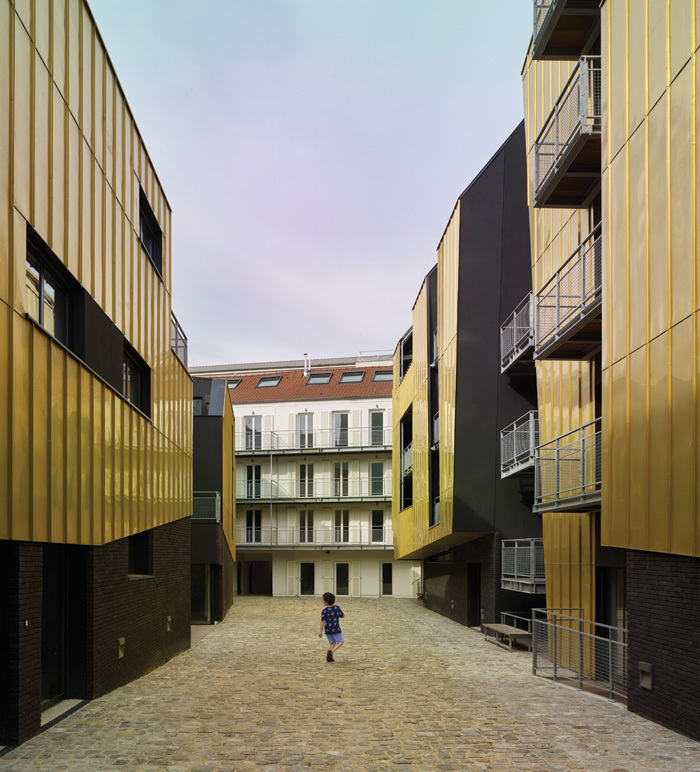 Overall, what Metek has done on a restricted budget is impressive — and the introduction of bold, mould-breaking architecture to the Paris townscape (albeit hidden from immediate view) is a welcome one, especially as its use for social housing contributes to the broad rethinking of what affordable homes should, or could, look like. It’s a shame to see particular elements of material degradation already, and the design of the exterior staircases and passageways could have certainly been softer, but the focus on community and public shared space — alongside ample individual outside space — promises to make this ‘small village’ in Paris’ northwest edge a successful one. Metek will be an interesting practice to watch.